You've finally found a REAL sisal rope source. We offer a bundle of 200 ' of 3/8" diameter sisal rope, as well as larger coils (scroll down to buy). 200 feet is more than enough sisal rope to wrap a round post with a diameter of 4 inches and a length of 5 feet. Scroll down to place your order. Feline Design has been a brand trusted by our many dealers and loyal retail customers, constructing quality cat furniture and scratching products since 1986. This is our bread and butter, and our primary activity day in and day out. Before you embark on your project, we'd like you to consider letting us make one of our great cat scratchers/condos for your cherished feline companion. Our basic sisal scratching posts start at only $42, and we encourage you to at least check out this option. The advantages of having us do this work for you are many, but perhaps the most significant one is the valuable time you will save. How much is your free time worth? And what could you do with that precious time that could be gained by investing in our professionally made product as opposed to doing this work yourself? 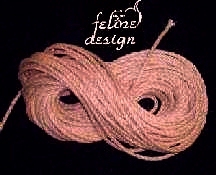 We began selling bulk sisal rope as a service to those who are determined to make their own cat furniture. We often have a portion of our rope inventory that can be sold to the do-it-yourself-er. It's evident that most other rope suppliers either don't actually sell the type of rope needed for this application, or they really aren't tuned into you as a cat lover. So when we have more than an ample supply of our rope to meet the needs of our production, we're happy to offer it here. This is Genuine sisal rope, a product we have used for well over 25 years (yes, you read that right). It has a rough finish which cats prefer scratching, as evidenced by our loyal return customers, and repeat business from our dealers throughout many years. The diameter of this rope (3/8") is 50% thicker than the leading popular imported brand of cat furniture uses (1/4"). 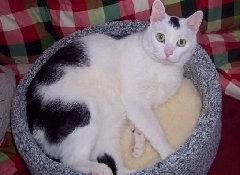 As a result, your cat gets more scratching per post, and you do not need to replace your cat scratchers so frequently. You can now buy the same rope we use on our products..
How much rope do I need (a serious factor which needs to be addressed)? Over my many years of sharing my sisal rope supply with the "do-it-yourself crowd," questions about individual project requirements usually haven't been answered to the asker's satisfaction. This is primarily due to the wide variety of sizes of posts/columns/shapes being wrapped. It would be great to hear from another gifted cat owner to let the others know about what size rope length to purchase. If you are this genius, please click here to share your genius with the rest of us. You are likely to find several web sites with what seem to have perfectly logical and completely flawless mathematical models of how to arrive at this figure. Valerie's ( one of my geniuses ) formula considers some factors which these others do not. The factors are not likely to be discussed at length in your old, dusty geometry textbook. So with all due respect to Mrs. Miller, my H.S. geometry teacher ( who once told the class that I was "on the road to ruin" one time! heh, heh, heh.....are we THERE yet? ), I know this from doing it, and your formula won't work in this instance, Mrs. M.
Fact is, I've taken the time to prove this in my own shop, using several widths and lengths of columns, and so I feel confident in offering this particular equation for someone who wants to do the job right the first time. I know that there are some of you out there saying to your computer screen, "Math is math. You can't argue with math." Let me just ask you one question: "Is a 2x4 board EXACTLY 2 by 4 inches?" Well, for those who don't know, it isn't. In fact, it's not. The geometry of your project isn't exact, either. But you can account for some variations by taking some practical measures, rather than theoretical ones. Thanks to Valerie, I am able to provide you with one possible way of arriving at the footage needed for your project. You'll see a "footage kit." shown below as a purchase option. This kit contains a 5' length of our sisal rope, as well as instructions on how to apply Valerie's calculation to your project. This length of rope is plenty to make such a determination for most common sized columns, posts, and tubes from the smallest tube on up to 16" & even a bit wider. The formula that will be provided is most applicable to ROUND structures, but you can use the rope provided to estimate what you'll need to wrap 2x4's, 4x4's, etc... This purchase is non-refundable, but its $15 cost of this is fully applicable to your future purchase of a larger quantity of this same exact rope. The kit will be shipped within 24 hours of your payment, since we know that this is only the first step of your cat tree project. Where is this rope from? In recent years, most likely due to their shaky economy, Brazil has been an unreliable supplier of sisal rope. We switched to a Mexican rope, which actually did meet all of our quality standards. So we had used this Mexican rope for two years or so, & might need to return to it at some point. The 2 ropes are virtually indistinguishable from each other. As of October, 2014, we secured a reasonably predictable supply of the Brazilian rope once again, and it is even better quality than our previous one in terms of appearance, texture, and lack of any industrial smell. It's a very nice rope which looks great on our cat furniture, and will hold up well under heavy scratching. So we're confident in offering this newer Brazilian rope to you. Thinking about buying this rope at a HARDWARE store? Buying from a home center or hardware store can be a disappointment. There are plenty of sources offering 50 and 100 foot coils of sisal rope. They can be from pretty much any country, and also can be pretty much as old as your grandchild on up to your grandpa. These coils have been produced in huge batches and shuffled around from warehouse to warehouse, possibly for decades. When you cut into the shrink wrap on these, be careful not to cut the rope, which may be so dry as to be brittle. Our rope is always in the pipeline. We are always using it for our own production, and so you can rely on it being FRESH. The largest size (1200 ft.) is coiled, banded, & sealed in a carton at the rope mill. Sometimes the coils are packaged upside down in the carton - not by us, but by the boneheads at the mill. If your rope from these coils kinks as you draw it from the original opening, just flip the box & cut a similar hole. This will avoid kinking. Our 732 length is broken out of a 1200 ft. coil (which has had 468 ft. removed from it). So, it will be unbanded until further notice. It will still be in a relatively compact coil, and will draw from the box in much the same way. The 150, 200, 375, 500, & 732 foot lengths are always taken from a larger coil, and are therefore shipped loose and not in a coil, sklein, spool, etc. However, every effort is made to place the rope in the carton so it can be dispensed easily, and the rope end is clearly marked and easily located. Typically, we tape the rope end inside one of the box flaps. Please note that rope which has been broken out of its coil is not returnable for any reason. We do not take returns on rope which has been broken out of the coil under any circumstances, unless we've just shipped you the wrong length (i.e. you ordered 500 ft. & we sent 350). You can send back coils that you decide that you do not want, but you will pay shipping. We've taken great care to describe this rope as thoroughly as is practical, and are not making any other claims about this rope (implicitly or explicity) other than what you are reading here. The shipping timeframes on our rope are also laid out and explained for the buyer, & may change from time to time. Our personal confirmation of your rope order will confirm how long it will take for us to ship your rope. Feline Design makes wrapped sisal rope columns for you folks who want the most tightly wrapped and carefully secured components for your cat tree project. If you use our columns, we can handle the business end of the design, and you can focus on the aesthetics! Each unit comes complete with hardware. From this page, you'll also be able to access information on our replacement parts & other components. All rope except the largest (1200') coil will ship within 1-3 business days of receiving your payment. The 1200' coil will ship within 5-10 business days. To avoid delays, select your shipping zone from the drop-down menu below ( where it says "Shipping"). International orders are welcomed. Kindly contact us for shipping outside mainland USA. We will provide you with shipping charges, and instructions for ordering. Footage Kit - Includes 5 ft. of 3/8" sisal rope, plus some information to help you calculate your rope requirements. The $15 cost is fully applicable to your future rope purchase. USPS First Class postage is included. YOU design your tree. We provide the professional rope wrapping and crow's nests. Please note that we don't give advice on your cat furniture project, but there is an abundance of this information available on the internet. In fact, the owner of this company has posted several articles online which are meant to help you. To access these, simply do a search on the following term: "flerper eBay guides". We hope that you'll find these articles useful.